Tender, juicy chicken spiced to perfection and tossed with fluffy quinoa, fresh veggies, warm naan and a creamy tahini sauce for a delicious dairy-free dish that’s sure to wow your tastebuds! 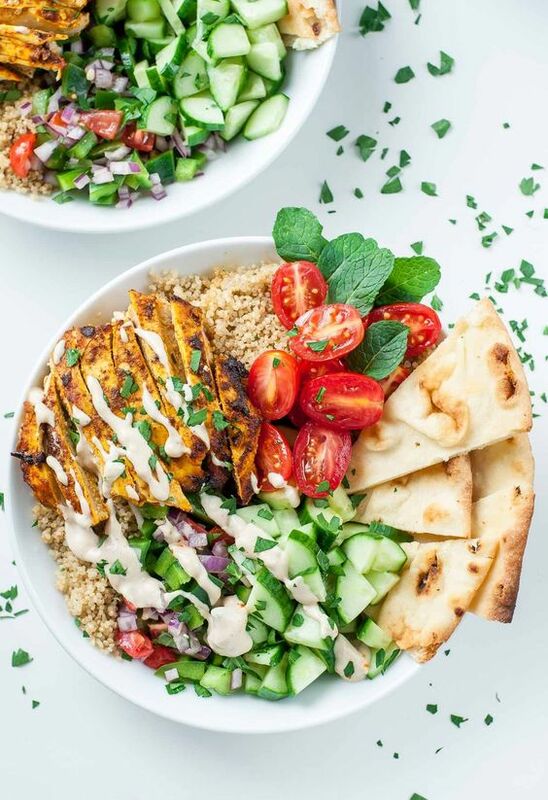 Healthy Chicken Shawarma Quinoa Bowls with a super easy hack for creating make-ahead lunches for work or school. The flavors are out of this world!! While the quinoa cooks, prep your veggies! Chop onion, bell pepper, cucumber, and parsley. Mince your garlic and slice grape tomatoes in half. Pat chicken dry with paper towel, then place a dry paper towel on top. Using a meat mallet or heavy pan, pound to 1⁄4-inch thickness. In a large shallow bowl or resealable plastic bag, combine cumin, paprika, turmeric, and cayenne pepper with juice of 1⁄2 lemon, minced garlic, and 1 TBSP olive oil. Add chicken and coat with the spices. Set aside to marinate at room temperature for at least 10 minutes. Snag your now-fluffy quinoa from the pot and give it a little fluff with a fork. Season with salt and pepper, to taste. Set aside. Remove chicken from marinade and season both sides with 1⁄2 tsp salt and black pepper as desired. Heat 1 tablespoon olive oil in pan from naan over medium heat. When oil is shimmering, add chicken. Cook until chicken is cooked through (165 degrees F), approx 3-4 minutes per side. Transfer chicken to a plate and allow to rest while you prep your quinoa bowls. Combine onion, bell pepper, cucumber, tomatoes, and parsley in a bowl and dress with juice of one lemon and 2 TBSP olive oil. Season if desired. For the tahini sauce, whisk together tahini, lemon juice, and minced garlic. Slowly add warm water, whisking well until thin and saucy. Season with salt, pepper, and paprika. Slice your chicken into thin strips or chop into bite-sized pieces. Now let’s toss it all together! You can plate the veggies and chicken on top as pictured above or toss the quinoa with the veggies first for goodness in every bite! Dress with tahini sauce and dig in!